Raymond Whiting is Professor of Political Science at Augusta State University. 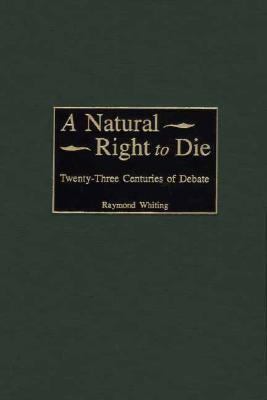 He has received both the University's Outstanding Faculty Member Award and a Governor's Teaching Fellowship AwardWhiting, Raymond is the author of 'Natural Right to Die Twenty-Three Centuries of Debate' with ISBN 9780313314742 and ISBN 0313314748. Loading marketplace prices 95 copies from $51.63 How does the rental process work?